A classic frozen in time. Earlier this year Royal Enfield Motorcycles released its latest offering to the motorcycling world in the form of the stylish 2014 Continental GT that was Inspired by the 1960’s 250cc model of the same name. 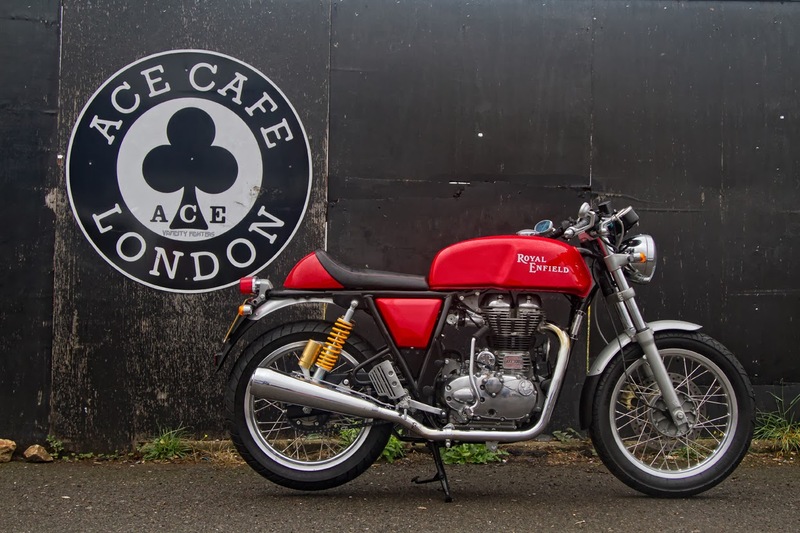 The official world launch of the new Enfield was at the iconic Ace Café in London which made an appropriate backdrop to the retro café racer styling. It is arguably the most modern of Enfield’s eleven model lineup; all based on the same basic architecture of the 1955 Royal Enfield 350cc Bullet. Royal Enfield, formerly Enfield India, has come a long way since the parent company was liquidated in 1971. The manufacturer now exports to numerous countries around the world and offers a range of apparel and riding gear with events designed to engage Royal Enfield enthusiasts in a way that many manufacturers use to make buying a new motorcycle a lifestyle choice. The latest in Royal Enfield’s model line-up, the 2014 Continental GT. But in 1988 the Enfield India Bullet was little known outside of the sub-continent. What follows is an article that I authored for Bike Australia in 1988 and perhaps charts some early small steps by Enfield to once again become a world brand. The Enfield name can be traced back to the middle of the 19th century when George Townsend and Company was founded in the Hamlet of Hunt End near Redditch in Worcestershire to make sewing needles and machine parts. They became involved in bicycle manufacturing in the 1880’s and in 1890 began producing their own brand of bicycle. Two years later the company changed its name to Eadie Manufacturing and for the first time used the Enfield name for a new range of push bikes due to a contract with the Royal Small Arms Factory at Enfield in Middlesex. In 1890 the name “Royal Enfield” was licenced by the crown and the slogan “made like a gun” with a field gun trademark was adopted. Their first powered machine was a quadricycle built in 1898 using a De Dion power plant, and in 1901 they made their first motorcycle that featured an engine over the front wheel powering the back wheel by a crossed over belt. It wasn’t until 1910 that Enfield became a serious motorcycle manufacturer when they started to produce large capacity V-twins. By the late 1930’s Royal Enfield were manufacturing quite a comprehensive range of machines, mainly singles of 150cc, 250cc, 350cc, 500cc and 570cc capacity with side and overhead valves as well as a small capacity two-stroke and a 1140cc side valve V-twin. 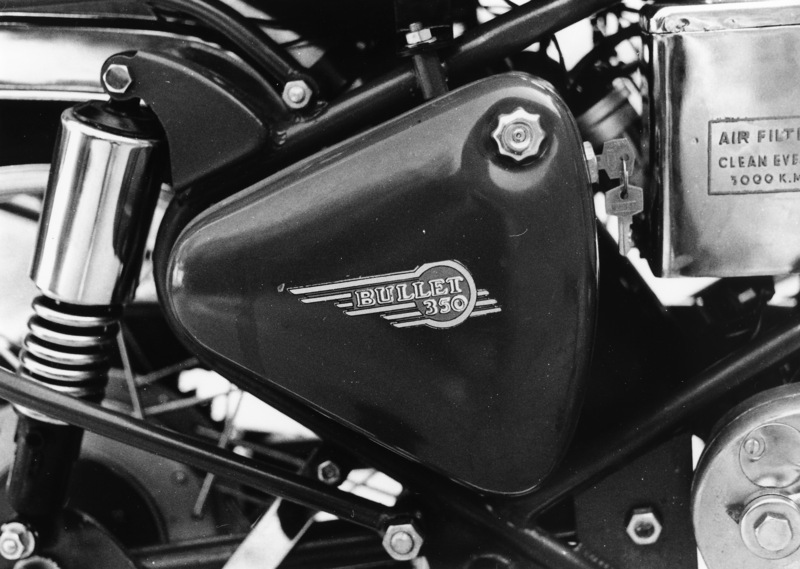 The “Bullet” range was first introduced in 1933 to satisfy the taste of more sporting riders. These were based on the standard models but with improved performance. Enfield though centred its competitive outings to off-road competition, which were mainly trials events. This fitted well with the Enfield image of uncomplicated, reliable motorcycles, suitable for everyday transport and the occasional weekend sporting event. Simplicity, headlight switch, speedo and amp-meter mounted in the headlight shroud. It was after the Second World War when the needs for basic transport had been satisfied that Enfield decided something a little more exciting than their prewar and wartime models was needed to keep its customers happy. So in 1948, the first prototype of a new model 350cc Bullet was seen in the Colmers Cup trial ridden by the works team. They caused a bit of a sensation at the time because they used a rear swinging fork suspension, which was unheard of in trials at that time. They had limited success first time out but soon showed their form by winning gold medals later that year in the International Six Day Trial as part of the winning British trophy team. The road going version was put into production in 1949 with a listed price of £171 9s 0p alongside competition versions for scrambles and trials. These differed only in minor details such as compression ratio, exhaust system, tyres and the general equipment fitted. Relatively little had to be changed from one model to the other, and all were very much like the original prototype. In 1955 Royal Enfield received an order from the Indian government for eight hundred 350cc Bullets for the Indian Army and Police. I was such a large order the company decided to set up an assembly plant in Madras India (now Chennai) for the 1955 model 350cc Bullet. In 1957 tooling equipment was sold to Enfield India Ltd. and in 1958 the first Indian made Bullet rolled off the production lines and is today still being produced virtually unchanged. 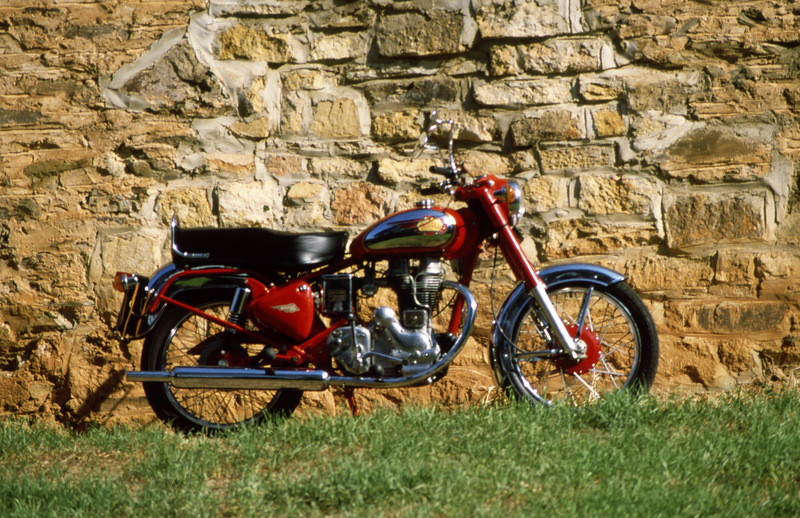 The Bullet ceased production in England in 1962 and the company folded in the early 70’s. 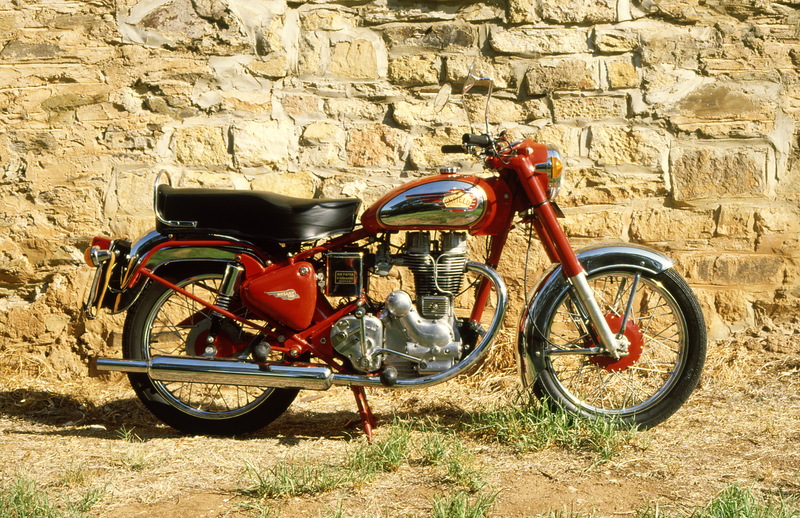 Part of its legacy being the surviving Indian company (it also seems ironic that the big 700-750cc Enfield twins used in the Constellation and Interceptor models were sold in the States as “Indians” after the famous American marque which coincidentally used modified Bullet barrels and heads). A real coals to Newcastle situation occurred in 1977 when British Laverda importer, Slater Bros, started bringing Indian Bullets into the UK. Some were unsuccessfully imported into N.S.W. in the early 80’s, but ADR compliance was never acquired. It took a South Australian company to finally get the Bullet to Australia and onto the showroom floor. Ron Lewis’ company T.A.S.C. Imports are part of a family business that has been involved in the automotive field for some sixty years. They specialised in importing American cars and parts and in 1971 were also importing Harley Davidson motorcycles. Unfortunately, the introduction of Australian Design Rules made it impossible to import complete cars, and they also stopped importing Harleys – which is a bit of a sore point with Ron as at that time it was impossible to foresee the resurgence of that marque in Australia. T.A.S.C. now imports new and used car components for British, European and American cars as well as the Enfield India Bullet, which they distribute under the name Enfield Cycles Australia. The ignition switch is housed in the side cover. In 1984 that Ron went to India to negotiate importing the Bullet to Australia and to purchase one for compliance purposes. This was thought to be a relatively straightforward effort. Unfortunately, it wasn’t. The major problems were with the exhaust system and brakes which were showing the modern day deficiencies of 1955 design. A new exhaust system was fabricated by Quad Pty Ltd to bring the decibels down to the required number, while Amdel laboratories helped in converting the front one-inch drum brakes to four inches in width and they also increased its mechanical advantage. Finally, three years later, the Enfield India Bullet achieved compliance with the factory adopting Ron’s improvements on all Aussie bound Enfield’s. One thing the factory had improved over the years was the electrical system – the original magnet dynamo being replaced with a distributor and alternator although they remained 6 volt. Enfield Cycles Australia latest shipment, however, does feature 12 volt electrics although the Bullet Deluxe will still be available in 6 volt form for those who yearn for the days when Joe Lucas was known as the prince of darkness……. Ron was kind enough to lend me a brand new Bullet Deluxe for a ride impression and to photograph. So it was with little trepidation that I arrived at Glynde Auto Wreckers to pick up the demonstrator as I hadn’t ridden anything quite like the Bullet before. Like any motorcycle with character, there is a definite procedure to starting it. First turn the right-hand side toolbox mounted ignition switch on, turn the petrol on, put the choke on, pull the left handlebar-mounted decompression lever in, kick the engine over until the amp-meter needle swings over to the left – then give it a good kick in the guts! 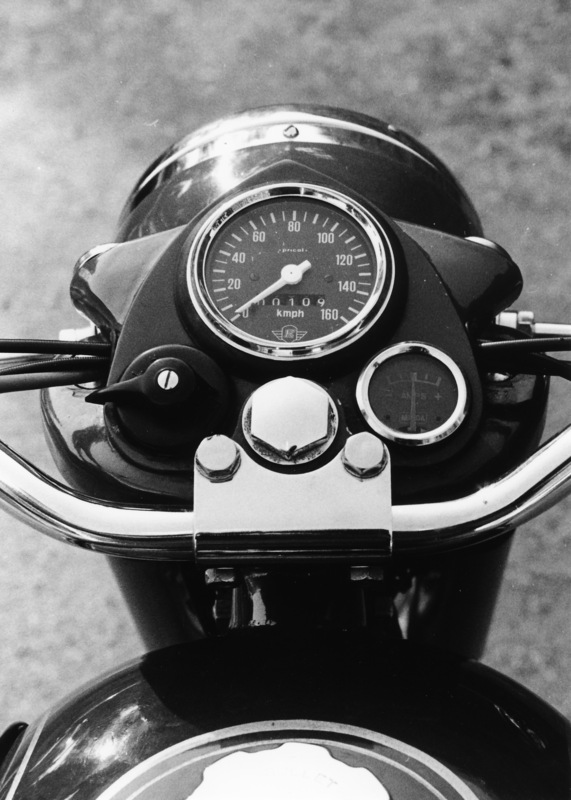 This generally does the job and you are rewarded with one of the best sounds a motorcyclist can hear – the classic sound of a British four-stroke single. Decompression lever aids kick-starting the 350cc single. First gear is relatively high, so it takes quite a few revs and a little bit of clutch slip to get it going, but the exhaust makes such a glorious racket that it’s thoroughly enjoyable. The gearbox is relatively slow and needs a positive movement to engage the gears correctly, while second and third gears are relatively close in their ratio’s which helps to keep that lovely exhaust note rising and dipping until fourth gear is engaged with a noticeable drop in revs and flattening of the exhaust note. It’s such a relaxing bike to ride, and apart from the exhaust (which is so enjoyable anyway), it is a very unobtrusive motorcycle. The ride is firm but well controlled, it handled nicely with a solid feel to it that inspired confidence. Ron pointed out that a properly run-in Bullet should touch around 120kph and be capable of returning an impressive 4.5 lt/100km from its 14.5-litre tank. The only problem I found with the Enfield was the brakes, which hadn’t bedded in fully and it took a fair bit of effort to get the Bullet stopped. Apart from that, there are a few minor ergonomic niggles that are part and parcel of owning a motorcycle that was first designed in 1948. The Bullet does, however, feature some excellent design ideas, such as the neutral select lever, which is handy at traffic lights, and the snail cam adjusters on the rear wheel to keep the chain correctly tensioned. The Enfield sports two good sized tool boxes which allow extra room for more tools (the standard toolkit is quite reasonable) and a puncture repair kit. Another nice feature is the single large alloy primary drive chain cover. It has a single central retaining bolt, which apart from its aesthetic appeal makes it very easy to work on the primary drive chain. The finish of the Bullet is pretty good too – it’s nice to see so much chrome on a production motorcycle again. The seat is trimmed by hand, and the pin-striping on the tank is also by hand. There are 1,864 parts that make up a Bullet and Ron has at least one of all of them so spares should not be a problem and it’s also a boon to restorers of this classic design. At the moment Enfield Cycles Australia have two versions of the Bullet available, the Deluxe and the Super Deluxe costing $4,460 and $4,940 respectively, with a more modern looking version the Bullet Super Star on the water. Another interesting aside of Ron’s involvement with the Enfield India Company was that it encouraged them to set up an export department, which bore the fruit of a shipment of Bullets to Japan that coincided with the first Australian shipment. A business associate of Ron’s in the States, Joe Cody of Pacific Automotive Exports in Washington State, is also taking them on for American consumption. Enfield Cycles Australia’s network has dealers in most States, but they would like to expand the number of outlets further and are in the process of looking for interested dealers. At home anywhere in the world. 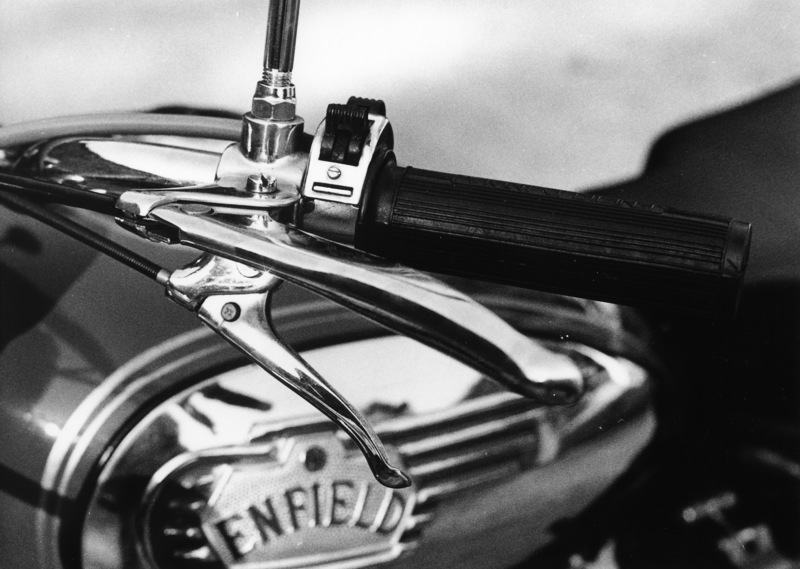 It’s hard to adequately define a niche in the marketplace the Enfield will fill. As Ron pointed out if there is a “type” of buyer for the Bullet it appears to be a more mature gent who owned something similar as a lad and is now in a position to purchase a one for the occasional Sunday ride. Some may say that a true British bike enthusiast might sooner spend the time and money on restoring the “real thing” than purchasing an Indian “replica”. But for me, the Bullet acts as a time machine transporting every sense of its rider to an uncomplicated era in motorcycling that must have been a lot of fun! Words and photographs Geoff Dawes © 1988. Published in Bike Australia 1988. Image http://www.helmetstories.blogspot.com. This entry was posted in Motorcycling and tagged Enfield India, Royal Enfield, Royal Enfield Bullet, Royal Enfield Continental GT on 31/05/2014 by Geoff Dawes.